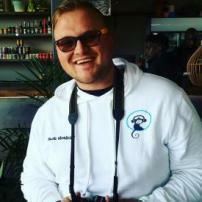 Adriaan Gerhardus Beeslaar, young South African author and currently the owner and writer for Blue Monkey Magazine and also the Entertainment Editor for Anytime Anywhere Magazine. Adriaan, nickname Riaan is the author of the young adult fiction book Firefly. Born 1992 Riaan Beeslaar only discovered his love and passion for writing at age 23 in 2015 when he started working on his young adult fiction novel titled Firefly. Currently, a freelance writer residing in Johannesburg, South Africa.